Indiana Doom traditionalists The Gates Of Slumber here present their fifth album of slow-paced rumbling misery, and as ever I’m hard-pressed to describe the awesomeness in mere words. Things are different this time around, however, the band growing even more dejected and mournful here than ever before. The rhythmic stoner-esque anthems of before are all but gone, drowned in a sea of despair. Instead The Wretch simply breathes melancholy, from the slow and pounding Bastards Born that opens the album in tormented style to the closing strains of Iron And Fire. These guys being the band that they are, however, you can’t help but enjoy the ride, as engrossed in gloom as it is, and few Metalheads with a taste for the old-school will be able to resist the Sabbath worship of said Bastards Born, woozy classic rock soloing mixed with hypnotic riffs that repeat themselves wearily, leant up against the rhythm section like an alcoholic against the bar. Life comes to the band a little with the following The Scovrge Ov Drvnkenness, a hard rock groove and slightly more aggressive vocals giving the impression of energy. You may approach that track expecting humour from the title, but by the time it ends, feedback eking out the last few seconds of the song, you’ll be well aware of what’s going on, and relishing the darkness for what it is. Perhaps perversely, this doesn’t make for an album short of neck-exercising moments. Coven Of Cain is probably the most likely to get you moving, and To The Rack With Them’s psychedelic swirl will have feet tapping and heads nodding despite the ever-present grumpiness. A catchy chorus appears like sunlight through the fog, yet it’s more like the chanting of an empty-eyed mob than the joyous anthemic stomp Doom generally manages. This is not an album for those in search of uplifting headbanging fare, make no mistake. Few shades of light are shone here, if any. Day Of Farewell’s despairing wails and the sparse pickings of Castle Of The Devil (which slides into a near-droning funeral march before going all Doorsy and laid-back) setting the mourning sun low indeed. The title track is suitably wretched, lyrics such as “I sold my soul long ago, and got nothing in return. Imagine what a fool I feel,” more than telling you what you need to know. By the time album closer Iron And Fire rolls around, a final gasp of life at the start soon being smothered as the track stays past its welcome, you’ll be more than sated. And that’s the problem with The Wretch, ultimately – it’s too much. It verges on boring, like listening to a friend whine about something that you care little about. Ten minutes less, and this would have been the big Doom release of the year. As it is, it’s a great album that’s ten minutes too long. 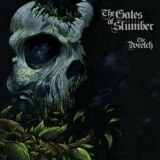 The Gates Of Slumber remain one of the best modern acts in the Doom genre, but this isn’t their best.